There has been a fair amount of confusion around the BitMEX cryptocurrency exchange. So much so that even players like CoinMarketCap have listed it wrong, thereby fuelling more fire to the confusion. But that’s expected because there are very few people in the cryptosphere who fully understand the workings of the BitMEX exchange. Moreover, I was bored reading confused, repetitive, and complicated explanations about the same. So today I have decided to review BitMEX exchange in an unbiased manner and tell you everything about it that matters. In this review today, we will touch base upon what BitMEX is, what it has to offer, and who it is for. BitMEX stands for Bitcoin Mercantile Exchange. It is a peer-to-peer trading platform that offers leveraged contracts that are bought and sold in Bitcoin. Well, I have been there. But then I learned about leveraged contracts, margin trading, and derivatives. Margin trading a.k.a. leverage trading is a term used in the trading markets. Derivative market is another form of trading market. Assume, you want to make an investment of $2000 in BTC, but you only have $1000. Now to bring in the extra $1000, you borrow that through the margin of 2:1 (it means for every dollar you have, you will get extra one dollar to invest. This is leverage or extra margin). 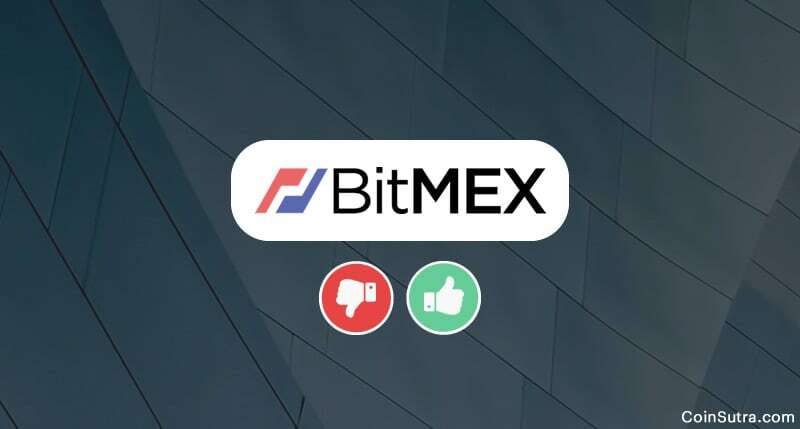 Simply put, BitMEX is an exchange that combines margin trading and derivates of crypto assets for cryptocurrency traders. If not, I recommend you not to get started with BitMEX because margin trading can be dangerous for your financial health and suicidal if not done correctly. I have highlighted the same in this detailed guide on margin trading: What is Margin Trading in CryptoCurrency: Learn How to Get Started. But if done correctly, it can be highly rewarding. In short, you don’t trade actual BTC for USD or other cryptocurrencies but trade actual BTC for Bitcoin & altcoin contracts that derive its value from actual BTC & altcoin assets. These contracts are called derivatives. We will talk about the types of contracts further in this article. Note: The BTC/USD market on BitMEX is a derivatives market, NOT spot trading Bitcoin. BitMEX is wholly owned by HDR Global Trading Limited. HDR Global Trading Limited (hereinafter referred to as BitMEX) was incorporated under the International Business Companies Act of 1994 of the Republic of Seychelles and operates from Hong Kong as of now. Perpetual Contracts: A Perpetual Contract is a derivative product that is similar to a traditional Futures Contract, but there is no expiry or settlement like traditional futures. Perpetual contracts mimic a margin-based spot market and hence trade close to the underlying reference Index Price. This is available only for BTC. BitMEX Upside Profit Contracts: It allows buyers of the contract to participate in the potential upside of the underlying instrument. This is available only for BTC. BitMEX Downside Profit Contracts: It allows buyers of the contract to participate in the potential downside of the underlying instrument. This is available only for BTC. Note: Contract-wise, the fees and leverages are different and we will discuss it later in this article. Currently, BitMEX only supports deposit of BTC cryptocurrencies though you may see different indices. But that doesn’t mean it accepts USD or other deposits. Note: On BitMEX exchange Bitcoin is still denoted by XBT. To know more about the reasons behind it, read this: Are The Bitcoin Symbols ‘XBT’ & ‘BTC’ Different? BitMEX is the only exchange right now in the market that provides 100x leverage. It means for every BTC you have, you can leverage up to 100x and trade as if you have 100 BTC in your pocket. Note: To leverage trade on BitMEX only BTC deposits are accepted, and no other currency is accepted for accounting sake. All profit and loss numbers are also in BTC terms. That’s why it only provides BTC wallets to deposit and withdraw BTC. 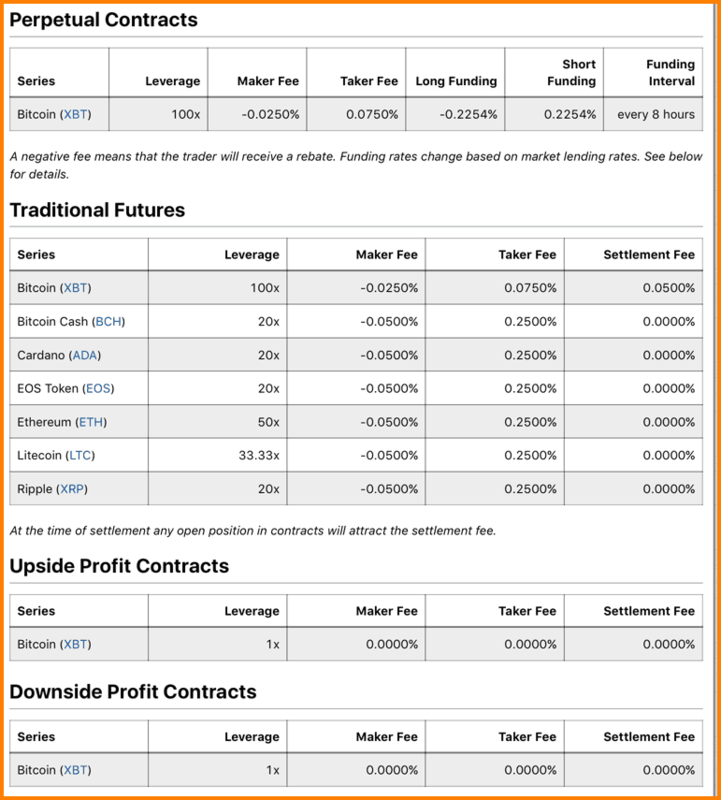 BitMEX fee also varies, depending on the cryptocurrency you are trading in and the type of contract it is. Here is the fee break-up for the same. Note: BitMEX does not charge fees on deposits or withdrawals. When withdrawing Bitcoin, the minimum Bitcoin network fee is set dynamically based on blockchain load. BitMEX addresses are multi-signature with multiple keys with multiple holders. BitMEX systems take advantage of Amazon Web Services’ world-class security. The BitMEX trading engine is the first of its kind. Written in kdb+, a database and toolset frequently used by major banks in high-frequency trading. BitMEX is open for all customers and traders worldwide, except the United States. However, some US customers have worked out their ways to BitMEX via VPN setups, which I should inform you, is prohibited by BitMEX. The company does take measures about the same but those are simply not enough for the impersonators to get in. They also have a comprehensive knowledge base in place to help you resolve some of the common pressing issues by yourself. 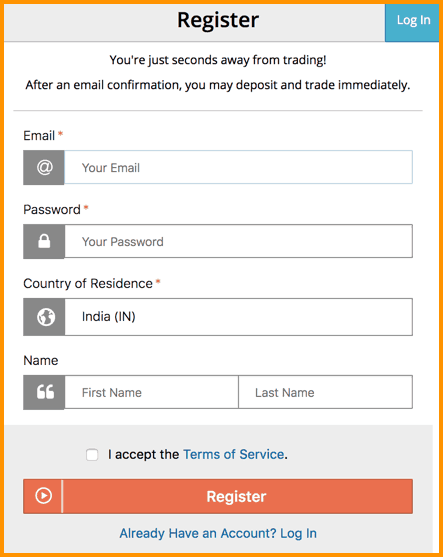 The registration process on BitMEX is simple. You need your email to get started, plus, you can also secure your funds using the 2-FA authentication feature that BitMEX provides. Upon completion of registration and login, you will see this dashboard page. It looks busy but it has all the necessary options you need in place. From there on, the UI is quite intuitive, provided you are well versed with the margin and derivate trading lingo. Also, as I said before, margin trading, especially in the cryptocurrency market can be highly risky. Therefore, it is best left to experienced traders who understand it well. No one is born an expert. Practice makes them a specialist. That’s why BitMEX has a test interface on Bitcoin testnet using which you can practice mock margin trading on the same contracts. 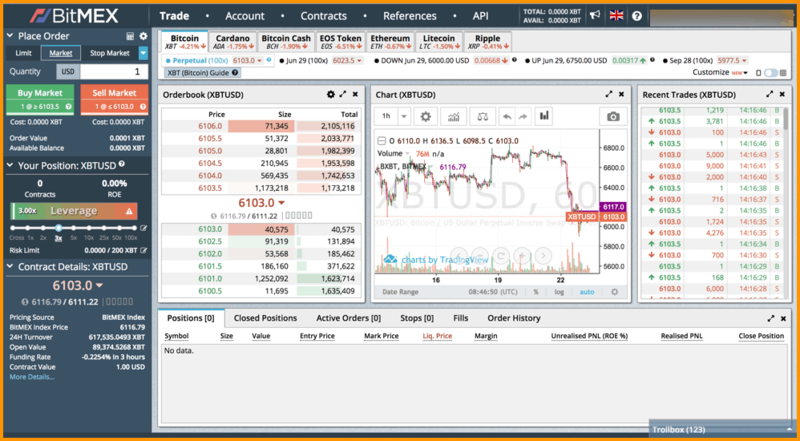 Here, you will find all the exact functions and features as you would on the real-time BitMEX exchange. But to use the feature, you need to register again. The same credentials, as on the real BitMEX exchange, will not work. Is BitMEX Legit & Safe? Yes, BitMEX is highly rated and one of the safest exchanges for margin trading cryptocurrencies. Here you will not find spot trading but one still has to deposit BTC in it, and that’s why they have stringent security measures in place. Plus, there has been no major talks on public forums about its hack or inconsistencies yet. And that’s because very few people know how to margin trade cryptocurrencies and not many reviews are available for the same. But concerning reviews related to margin trading, it is no doubt BitMEX is the best in business. Its daily volume speaks for itself which also conveys that it is a legit exchange. It is not like they have never been part of any controversy. Here is one incident when BitMEX accepted its insider trading advantage. 3.1 Is BitMEX Legit & Safe?